With the easy control and the setup via swipe gestures on the 24 "touch display, the future of Smart Milling is already available at DATRON. 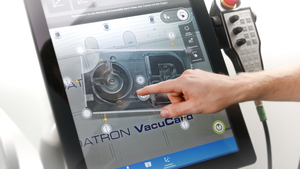 From 13 through 17 September visitors to this year's AMB can experience the immediate future of manufacturing technology live with chips flying at the DATRON booth (Hall 7, Stand A52). In addition to targeted developments of best DATRON technologies for high-speed milling in particular aluminum, plastics, composites and other high-tech materials, the mechanical engineering specialist from Mühltal near Darmstadt showcases for the first time its ultra-compact new product DATRON neo with a revolutionary control. DATRON milling machines are characterized by a high machine rigidity, which is considered an important aspect of the high-speed machining. The rigid, vibration-resistant construction of DATRON’s very compact gantry machines ensures excellent surface quality during the milling process and therefore accurate results. At AMB 2016, visitors can experience the large-scale, high-precision milling machine DATRON MLCube LS in economic panel processing live with chips flying. It is suitable for the production of front panels and enclosures made of aluminum. At AMB the MLCube LS, which is DATRON typical in spite of the relatively large working space (travel 1,520 mm x 1,150 mm x 245 mm), a relatively small footprint (2,410 mm x 2,280 mm x 1,950 mm) required, milling a complex workpiece from the aerospace industry. The innovative milling technology of the DATRON M8Cube was developed for machining high-tech materials and has become indispensable in many industries and applications. At AMB Stuttgart visitors of the DATRON booth can experience the dynamic production of highly precise microwave antennas with a filigree cutter geometry. 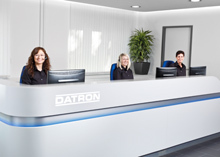 Both DATRON machine solutions provide users with inexpensive multiple added value: the highest quality with minimal processing time within the smallest space.